Forward signs a two-year deal, becoming Tiger's first major signing. Western Bulldogs AFLW co-captain Katie Brennan, has signed with Richmond for the 2020 season. Richmond this morning reported the news on their website. The forward informed teammates of her decision to leave the club on Tuesday. Brennan has been captain and co-captain of the side for all three years of the AFLW and departs having kicked 15 goals from 13 games. She will join the Tigers for their first year in the competition, alongside expansion clubs Gold Coast, St Kilda and West Coast. The 26-year-old stated that her desire to move revolved around her need for a “fresh start”. Bulldogs’ general manager of women’s football, Debbie Lee, was “naturally disappointed”, with the announcement. 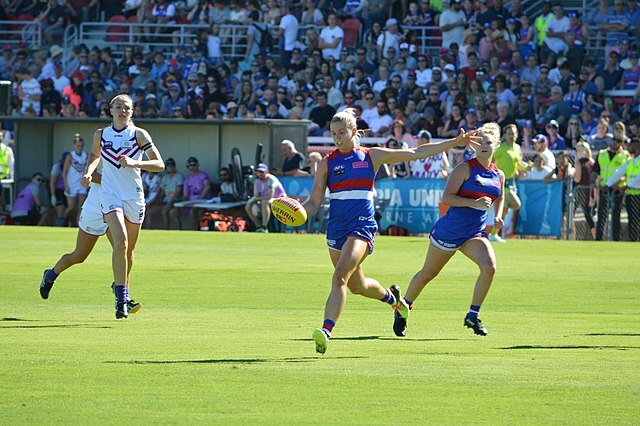 “Katie has been a foundation player of our women’s program, is a co-captain of our group and someone we have supported through some difficult periods, including injury and the tribunal process on the eve of our history-making AFLW Premiership,” she said. Lee admitted that restrictions on player contracts have been a problem for retaining players. For the first three seasons of the AFLW clubs could only sign players on one year contracts. However, that will change for the 2020 season with the AFLW announcing that players can be signed for two-year deals. Expansion clubs can sign a maximum of four players from any Victorian team, the Adelaide Crows or GWS Giants and no more than eight players from Fremantle or the Brisbane Lions. With the four expansion clubs looking to establish their lists, the poaching of big-name players is expected to continue. Fox Footy wrote that GWS forward Christina Bernadi and Lion Sabrina Frederick-Traub are also expected to move to Richmond. The AFLW trade period began on Monday and runs until 18 April, before the second period goes from April 23 to 26.